At the Petaluma farmer’s market in September, I found a stand with a big box of organic paste tomatoes (romas) which was on sale because they were overripe. I picked out some good ones then thought, wait a minute, and turned to the farmer and asked to buy the whole box. “I was hoping some one would ask me that!” he said. I ended up with 20 lbs of luscious organic paste tomatoes for $12. Only a few ounces of them were too far gone to use and I lost less than a pound total to stems and bad bits. Yes, you do want paste tomatoes for this. 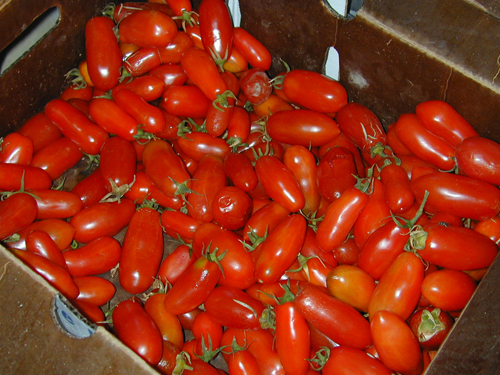 Roma is the most available variety but there are others, including many heirlooms. 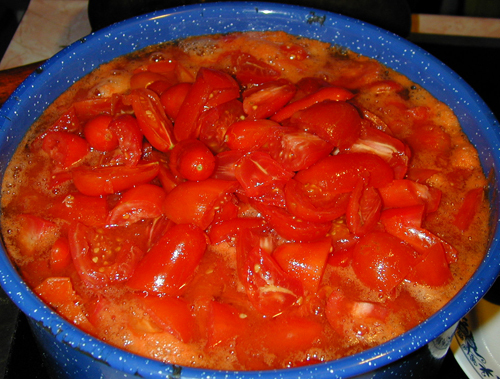 Paste tomatoes are drier than slicing or cherry tomatoes so there is less liquid to cook down. They also stand up better to long cooking times. If you eat a paste tomato raw, it won’t have much flavor. But trust me, once you’ve simmered or roasted it will be intense. 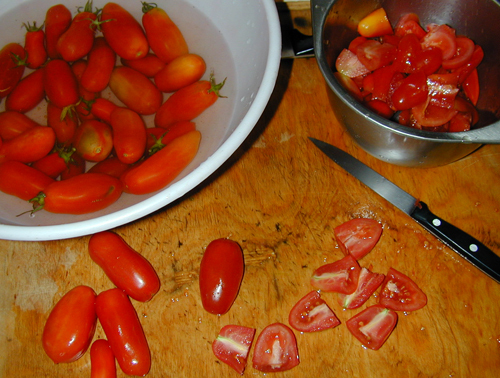 I washed the tomatoes by immersing in a bowl of water and lifting them out, minus their stems. Then I cut out any bad parts and then sliced into quarters (or so). I think I am not going to bother to cut them up next time. They really fall apart easily in the pot and you puree them later anyway. But I will inspect each and every one for scars or bad spots (cut out the stem ends if they are large or woody). And of course to make sure no stems or leaves are there. Simmer on low heat in big pot for several hours, let it sit overnight with the heat off, then cook some more. Note how the picture shows some bubbles on the edges but no bubbles from boiling. That’s what you want. Boiling is much too hot. Check and stir often. When a few hours from the end, add a bit of salt and 2 bay leaves. 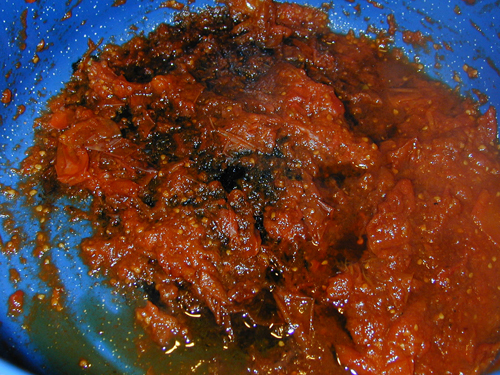 If you’re not careful about the heat or stirring frequently, you will end up with some burnt parts on the bottom. In fact, a lot of sauce recipes just assume you will have some “crust” at the bottom and tell you not to stir too deep. But you can prevent all or most of it if you’re watchful. Don’t worry about some browned stuff at the bottom though. And, by all means, do not–I repeat, do not–let your spouse put a lid on the simmering pot in order to do something else on the stove and accidentally knock the dial of the electric stove from “single burner low” to “double burner high” and then ignore it because it’s not his sauce. When I went to check on it 20 minutes later, it was bad. Smokey smell and a burnt taste in the sauce. I was not a happy chef. 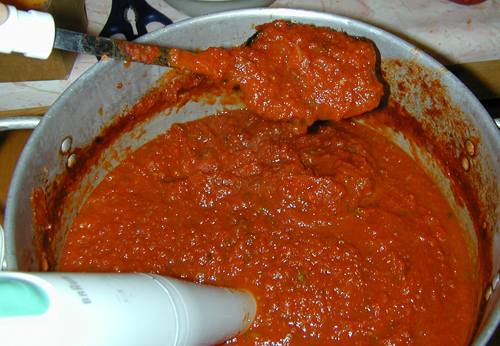 Carefully move the sauce to another pot (do not pour; scoop and avoid touching the bottom). Put in some sugar to counter the burnt flavor (I used 2 tablespoons). Add a raw peeled potato to the sauce and simmer it in there for a while. It soaks up the bad flavor. It did work. The sauce has a definite smokey undertone but it’s still very good and usable. 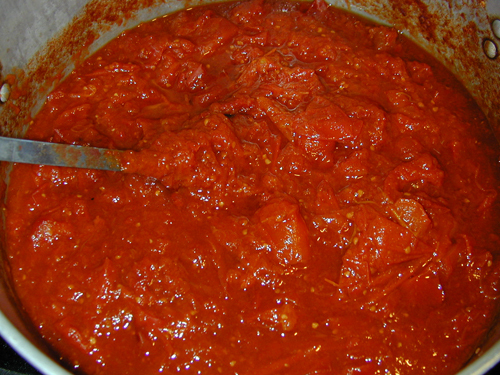 When the sauce is done, it will be much reduced from where it started and the tomatoes will have completely fallen apart. It should look like this. 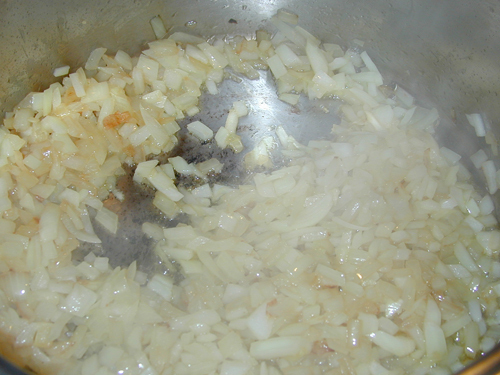 I then sauteed 2 medium onions, diced, in olive oil. For some (okay, most) applications I brown the onions but you don’t want to do that here. The flavors will be off. Make them translucent but stop before you get more than a hint of browning. You can add most anything you like to your sauce. If you like garlic, put it in with the onions. If you want vegetables, dice them and either saute with the onions or add to the simmering sauce a couple hours before it is done (since it’s at low heat, it cooks things very slowly). I decided I wanted a plainer sauce, so I could change it up as I liked later. So I only added the onions (with olive oil), salt, and some fresh rosemary, oregano, and basil (very near the end). Now it’s time to puree the sauce. You can do this before or after you add the onions or anything else, depending on what you want. I pureed after adding everything. Be absolutely sure you remove all the bay leaves first though (and the potato if you burned your sauce). I used my trusty Braun stick blender, which is perfect for this application. I wanted the sauce to have texture but be reasonably smooth. This batch gave me 22 cups for freezing and 25 oz for the fridge. Pyrex makes some 2 cup round glass storage containers with tight fitting plastic lids which are great in the freezer. You can defrost the sauce the day before in the fridge or just slide it out of the Pyrex into your pot or nuke the glass (remove the lid first). This sauce is of course great on pasta. We also like it on sauteed tofu.